We have previously discussed the significantly revised 2005 Honda CBR600RR, and offered this link to a European media kit that will answer more questions than you might possibly have about technical changes to this new machine. We won’t bore you with all the details a second time, except to summarize what is new for 2005. Let’s start with weight savings. The biggest knock against the 2004 600RR was weight. When it’s competitors were put on the scale, it turned out that the 2004 model was a bit of a porker. More than 20 pounds heavier than some of its competitors, this was a significant issue. For 2005, Honda claims it attacked every piece of the motorcycle with a chisel to shave weight wherever possible without compromising the reliability of the bike. We believe it. Here’s why. p>Before our one-day street ride, a fellow journalist asked the Honda press representative whether we could weigh the 2004 and 2005 CBR600RR assembled for our sampling. Having just given us a speech about weight savings, the press rep couldn’t say no. The well-prepared colleague of mine walked over to his van and produced a sophisticated (and purportedly accurate) scale, consisting of two seperate devices placed under each wheel. We then rolled a sample of each year’s CBR600RR, fully gassed up (the tanks are roughly the same capacity), onto the scale. The result? The 2005 model was a stunning 18lbs lighter than last year’s 600RR. This puts Honda back into the ballpark, and although still not the lightest in the class, the weight difference now becomes insignificant. Interestingly, Honda’s current press literature describes only a 9lb difference between the two years, yet other journalists who have weighed the two bikes have come up with as much as 20lbs (corroborating our 18lb finding). Chalk it up to an overly optimistic dry weight figure published by Honda for 2004. Having addressed its most significant “problem” with the 2004 model (which was nevertheless a great bike), what else does Honda offer in the way of changes for 2005? Aside from some minor styling updates, the first thing you notice is the inverted fork and radial-mount front brake calipers. Honda is keeping pace with class competition here, as all the Japanese competitors now have these features. With four pistons in each caliper gripping 310mm discs, coupled with the significantly lighter machine, you would expect a dramatic increase in braking power. Our ride confirmed this. Honda couldn’t leave well enough alone when it came to the engine. The 2004 600RR had plenty of steam, but Honda changed the intake port shape and redesigned its exhaust for increased midrange power. Fuel injection flow was increased to match up with the increased airflow resulting from these changes. 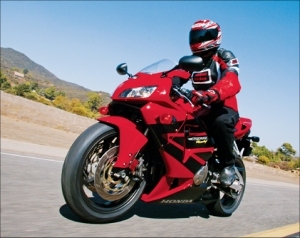 We had a chance to ride the 2005 CBR600RR through the canyons just off the Malibu coast. In the company of some good riders, we were able to push the bikes at a good street pace, and come away with some solid impressions. We also rode the bike back-to-back with the 2004 model brought along by Honda for comparison purposes. Not surprisingly, the weight reduction is noticeable while riding. 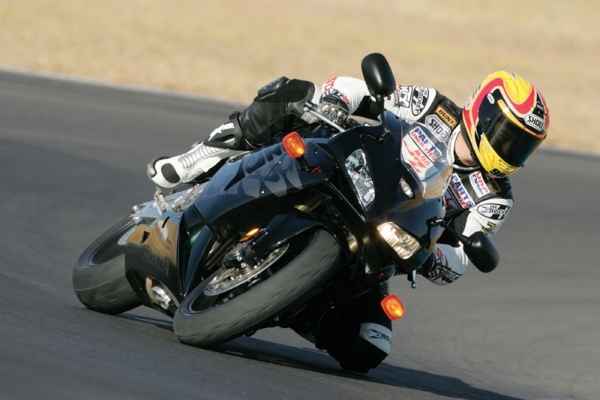 The 2005 edition of the CBR600RR feels just a bit quicker doing everything. Side-to-side transitions, acceleration, and braking all benefit from the weight reduction, and make the 2004 model feel a bit soft and lazy by comparison. The new bike also feels a bit more stiffly sprung in the suspension department. It felt like Honda made some changes to the shock to balance it with the new inverted fork. The bike is a tad less comfortable during lazy street riding, but responds better when ridden aggressively. As usual during these single-day press events, we did not have much chance to play with suspension settings. 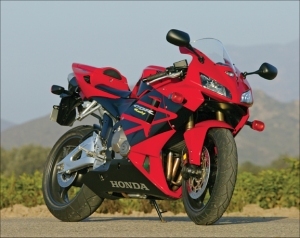 As delivered, the CBR600RR felt relatively balanced front-to-back, without any real suspension issues. Some fine tuning might deliver a bit of the plushness of the 2004 model, however. We will find out when we get a test unit for further evaluation. The surprise was the engine performance. It is difficult to tell how much of the increased performance we perceived resulted from the weight reduction versus the minor engine modifications. Nevertheless, the bike felt quite a bit stronger in the midrange than the 2004 model, and seemed to have a smoother, less stepped power delivery. In short, the engine seemed to deliver predictable, strong power for the supersport class. Very impressive, really. The 2004 model had good brakes, no doubt. The new front binders, however, are in a different league. Much bigger power comes from less lever effort. Like other bikes in the class, Honda now has front brakes that require respect and careful modulation from novice riders. All riders will learn to appreciate their performance, however. As a footnote, Honda continued their practice of providing these sessions without benefit of a photographer. Unable to drag one of our own photographers to Torrance to chase us around the hills of Malibu, we are stuck utilizing the stock photos presented here from Honda’s press CD. This is clearly something we do not like to do (although, frankly, the fellow posing for Honda’s brochure photographer looks quite a bit better than yours truly did during the Malibu trip). At a US MSRP of $8799, you can pick up a 2005 Honda CBR600RR here in the states in one of four color schemes, including red/black, black/tribal, metallic silver/black, and solid black. Take a look at Honda’s web site if you need even more information, and stay tuned for our supersport shootout.